The Greedy Pinstripes: Will MLB Really Lock Out? I was eight years old, soon to be nine. The Montreal Expos were the best team in Major League Baseball and the New York Yankees were well on their way to snapping a long postseason drought in the American League. It was the first year I watched a MLB season from start to finish and it’s when my true MLB fandom began. The year was 1994 and it was also the last time there was a work stoppage in MLB and the last time the World Series was cancelled due to the collective bargaining agreement not being agreed upon forcing the players to lock out. Could we really be gearing up for another lockout just a couple days before the current CBA expires? I sure hope not, let’s explore. The major hang up reportedly is the inclusion of the International Draft in the new CBA. Some like the current system where players can ultimately choose where they want to go from the international market while others want a standardized and formalized draft much like the June Draft every season giving the power and control more so to the teams and organizations. This is actually a major hang up for some teams, especially those big market teams who are willing to blow past the spending restrictions every chance they get in order to rake in a haul of young talent every three or four seasons, and may actually cause a lock out in my opinion. This would come down to pure greed if a lockout was to actually happen. There is so much money in the game right now with new television deals, merchandising and attendance that this would be about three steps back to lock out. Even if the MLB Players Union and the league worked out the new CBA before the beginning of the season and it was business as usual by spring training this will leave a bad taste in many people’s mouths if a lock out occurs and that’s scary because the International Draft is definitely something to lock out over, don’t be fooled. It’s the future. 1994 was the first season I ever watched Major League Baseball religiously and I got a bad taste in my mouth when the season and World Series was cancelled. Do not leave another bad taste in my mouth before the 2017 season or the 2016 season may ultimately be my last. 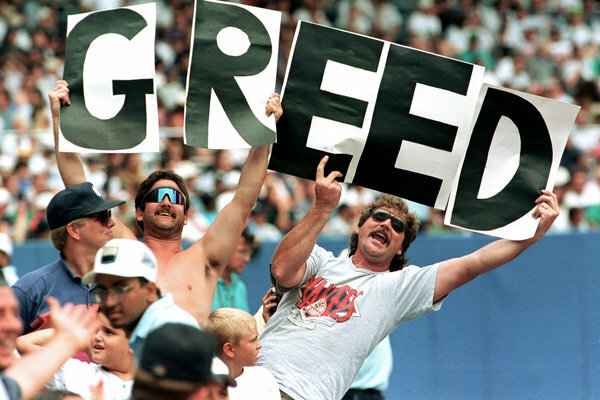 I know this is irony at its best when the guy who owns the Greedy Pinstripes starts harping on the MLB owners and/or players about greed but enough is enough. There’s plenty of money to go around and there’s plenty of players to go around. If you lock out because of it there will be one less fan to go around though and I’m sure I probably won’t be alone. You can bet on that. Bet. I don't see a lockout happening, but your belief that it could leave a "bad taste" is legit. The "greed" thing is why I say that. There's too much money at stake, for all parties, to not play.